Possible Team Names for the Sonics ~ The Bucky Channel - The World of Sports from Wisconsin's Perspective. 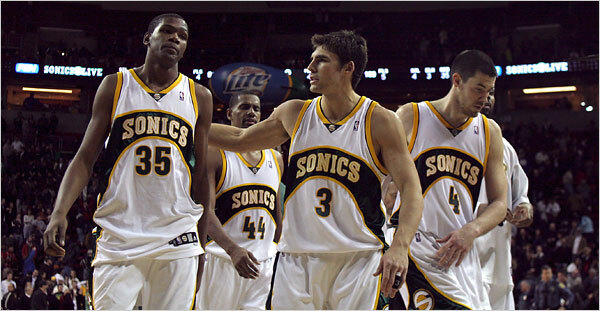 The landscape of the NBA is changing, as the Seattle SuperSonics are about to pack up their bags and head on down to Oklahoma City. But, with the name, color, and logo of the team remaining the property of the city of Seattle, this franchise is in for a new team name. We thought we'd come up with a few suggestions. Keep in mind the city is already home to the RedHawks (Pacific Coast League), Yard Dawgz (af2), Lightning (Women's Football), and Blazers (Central Hockey League). 66ers - I'm not a big fan of naming your team after a number, or a year, but it's one possible route for Oklahoma City. The town was a major stop on Route 66 during the early part of the 20th century, and was mentioned in the song "(Get Your Kicks on) Route 66" by Bobby Troup, later covered by Nat King Cole. Drillers - Oil production has always been a staple of Oklahoma City, but the name is already associated with their friends in Tulsa. Bricklayers - This would be named after Bricktown, a growing entertainment district in the city's downtown. However, "laying a brick" isn't a positive basketball term, so this one is unlikely. Twisters - Tornadoes are quite frequent in this neck of the woods, and it isn't that bad of a team name. That is, until a tornado rips through the city and kills people. Then it is a bad team name. Wranglers - This was the name of their now defunct Arena Football League team, and might not be a bad idea. Heartbreakers - As a way to aknowledge the pain and agony the franchise has caused to fans in Seattle. Stallions - The city's Remington Park is home to horse racing throughout the year, and the occasional horse show will come to town every now and then. It would also play on the "Old West" perception of the town. Thank you for making that change.